First off, thanks to everyone who joined in on the giveaway and thanks for all of those who are now connected on Facebook! I have some really exiting stuff coming next week, including a great interview, and hopefully another giveaway in the next few weeks! Kate! Just e-mail me from the contact page and let me know where to send the goodies. Rock Creek Runner is finding itself with tons of new readers from No Meat Athlete this week. So as a thank you to all of those visitors for both reading my guest post on No Meat Athlete and for clicking over, I thought I would give something away! In my opinion this is the best handheld water bottle on the market. 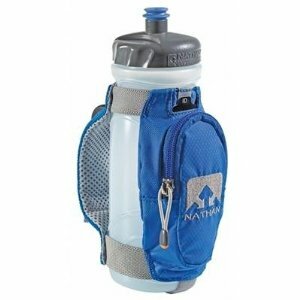 With adjustable straps, the perfect size pocket, and a 22oz bottle, it is great for long summer runs when you some extra fluids. It is a nice addition to any runner’s gear, and something you can never have enough of. The other day I wrote a post about 3 natural alternatives to energy gels. 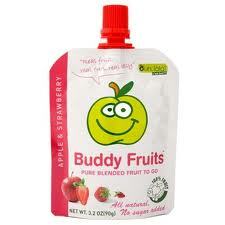 One of my favorite options for long runs is the Buddy Fruits puree. They are delicious, refreshing, and a great way to get those much needed nutrients during a long run. Because I’m feeling generous today, I thought I throw in 3 of these fruit snacks for you to try out with the Nathan Handheld! There are three, that is right, THREE simple ways to enter this giveaway. Leave a comment on this post about anything you wish! “Like” Rock Creek Runner on Facebook. If you already like RCR, no problem! Just let me know in the comments. Share this giveaway with all of your Facebook friends! If you ‘like’ me on Facebook or share the post, just let me know in the comments. If you do more than one, I enter your name up to 3 times into the hat! That simple. Oh, and on last thing. Only readers with US-based addresses may apply. Sorry, no international shipping. The giveaway ends at midnight on Thursday, May 3rd and the winner will be announced Friday morning! Yes – I am one of those new readers. The fruit snacks are intriguing – liked your post on substitutes for gels. And I would much rather have something natural that works. thanks! Rock creek is also perfect for brick workouts on he weekend. Already liked you on the FB. Shared as well! commenting on…. Asparagus, I enjoy the way it makes my urine smell. I am also a new reader! I found your blog because I live and run in the DC area. Looking forward to reading more of your posts! I’m one of the new readers from No Meat Athlete! Loved the post! Liked you on FB as well. I occasionally go out on a trail run when I’m feeling in a running rut and it usually gives me the kick that I need, but I’m gonna look around for some awesome nearby running “getaways” as well! Really enjoyed the guest-post on NMA and I’m excited to read more posts about trail runs in the DC area! Already liked and shared on FB. I always enjoy reading your blog posts. They’re extremely insightful. Count me in. New D.C. reader – great website. Hi there to every body, it’s my first pay a visit of this weblog; this blog contains remarkable and really good data in support of visitors.